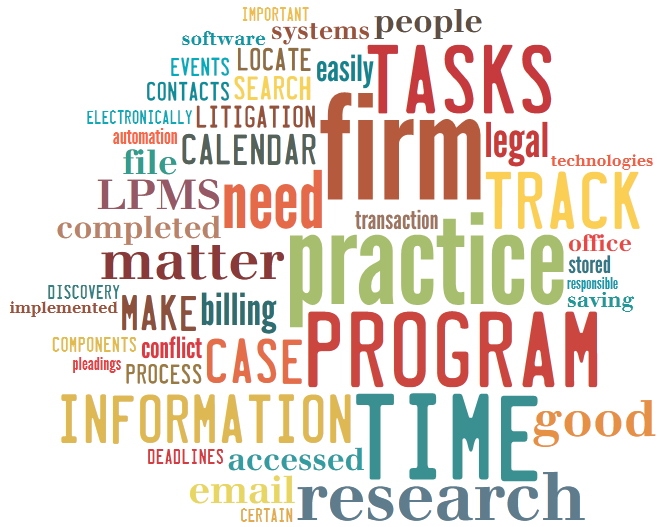 You are here: Home / Practice Management Software / What is Legal Practice Management Software? 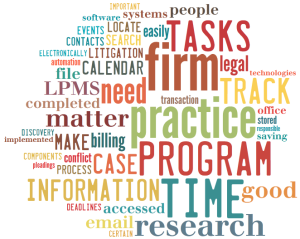 Legal Practice Management Software (LPMS) accumulates and aggregates all the relevant information about a case or matter – litigation or transaction – so that it can be easily accessed and used by lawyers and their staff. It is, in essence, an electronic case/matter file. While there is no set rule, basic practice management programs have four primary components: calendaring, task management, people management, and case/matter management. Law firms need to be able to track a variety of dates (depositions, closings, meetings, trials, phone conferences) and deadlines (statutes of limitation, filings, pleadings, discovery, tax returns). Firm members obviously need to know where they need to be at any given time, and any firm with more than a few lawyers and/or staff needs to be able to view the calendars for everyone in the firm. A good practice management program will make it easy to see the calendar of individual firm members or the calendars of many or all firm members at the same time. Additionally, docketing systems are used to track deadlines and critical dates that are better processed and handled on a docket list instead of a graphical calendar. To complete a will, a merger document, or to close a real estate deal, there are certain tasks that need to be completed, often in a certain order. The same holds true with the prosecution of a litigation matter from the filing of the pleadings, through discovery, to the completion of the appeal process. Practice management programs provide tools that enable firms to orderly track who is responsible for what tasks, when they are due, what tasks have been completed, and which tasks remain to be completed. Good LPMS include delegation systems that allow tasks to be delegated to others, making it easy to track task progress and to hold responsible the person to whom the task was assigned. Every case or matter revolves around people – plaintiffs, defendants, witnesses, counsel, opposing counsel, judges, calendar clerks, lenders, agents, clients and the like. The “old school” way of doing this – the Rolodex – has been around for a long time, so tracking people is nothing new. But, good LPMS maintain a single list of all the people with whom the firm is in contact, with tools that enable them to easily search and locate the information that is needed. A tremendous amount of information can be stored – multiple phone numbers, multiple addresses, important dates, email and web information, family information, etc. – and easily accessed. Whether it is a litigation matter or a transaction, there is a wide variety of information that needs to be tracked – phone calls, e-mail, faxes, memos, notes, documents, contacts, events and tasks. A good practice management program provides tools to enter and then access this type of information from a central location. Being able to work with every aspect of a case or matter without having to searching the office for the paper file is a central and key function of practice management software. All good practice management systems have these primary components, but also have a number of other modules that cover almost every area of the law practice. Law firms implement all types of manual ways to make sure that a deadline isn’t missed, or a file doesn’t get ignored. A good LPMS enables the firm to make sure that users are constantly reminded of upcoming events. Cases or contacts that are not “electronically touched” in a certain period of time – say 90 or 180 days – are highlighted and brought to the attention of the firm. All law offices need to make sure that they do not have a conflict prior to taking on a new client or case. Many firms rely on their billing program for conflict checking. The problem with this approach is that there might be conflicts that are not going to be found in the billing system – witnesses, vendors, experts and the like. Properly implemented, a practice management system is far more capable of locating a conflict because all the people and contacts that are related to a particular case or matter will be subject to the search. Much of what happens in most law practices – litigation or transactional – is very repetitive. A good LPMS with rules based processing takes advantage of such patterns and repetition by automatically setting up events, tasks, phone calls, creation of documents, etc., based on an initial meeting, the filing of a particular document or some other triggering activity. One of the biggest time saving legal technologies is document automation – software that quickly compiles complicated documents like wills, trust, corporate documents, pleadings and discovery. Much of the information that is used in these documents will be found in the practice management program. Good LPMS will link to document automation programs (Word, WordPerfect, HotDocs, TheFormTool, Pathagoras) so that case or matter related documents can be quickly generated. As discussed in the previous section, one of the biggest time saving legal technologies is document automation. But, how does one track all the documents that the firm creates? And how can these documents, as well as all the letters, motions, notices, and other documents that are received on a daily basis, be easily located and accessed from within the office and remotely? Even more important and more problematic today is the handling of email. While tracking documents is still important, email volume exceeds that of documents by more than 20-1. So, how can email received by anyone and everyone in the office be stored and shared? Good practice management systems have integrated document and email management components that let you easily capture the documents (faxes, letters, ECF, etc. )and email, store them in a consistent way, and then make it simple for anyone who is authorized to view them to locate them. All firms need to have some way to track their time and billing. Practice management programs track events and tasks many of which form the basis of many of the time entries. Because much of the information needed by the time and billing program is already entered in the LPMS, time and expense slips should be able to be generated in the practice management program and easily transferred into a time and billing program; or the practice management system should have a time and billing system integrated into it. Either way, this allows for the easy creation of billing slips, and makes it less likely that time will be missed. Storing on-line research information for later use can save an incredible amount of time. Say, for example, that research is conducted for a motion that sits dormant with the court for several months or longer. What happens when the judge asks for supplemental briefing? The associate who did the research is no longer with the firm and who knows where the legal pad is that contains the original search terms. A good practice management program that tracks legal research would make it possible to quickly update prior legal research with a few clicks of the mouse. If legal research is saved as it is performed, this also means that legal professionals in the firm have access to the research of others. The first step in legal research then becomes a quick search to see if anyone else in the firm has conducted the same or similar research as that which is currently needed. Even in a small firm it is possible, if not likely, that lawyers will end up working on issues that others in the firm have already handled. This type of collaboration will result in more efficient research and superior work product.